I’m sure you’ll agree, that if you’re adding a fire pit to your backyard, it should match your lifestyle, be the right size, and be easy to maintain. Those were also our top criteria for selecting the best fire pit for your outdoor space. If you want to cut to the chase and get fireside, the CobraCo Diamond Mesh Fire Pit features a classic look that goes with any decor and is built to last many seasons. There’s nothing more transfixing than a fire which is why a fire pit always becomes the center of attention at any barbecue, camp site, or outdoor gathering. It’s also possible to cook delicious food over the flame. Food such as hot dogs, marshmallows, toasted cheese, and so much more. When you’re in the market for a fire pit, it can be daunting to choose as you narrow down your search. There are so many kinds of fire pits on the market, and they all come in different styles, colors, shapes, and are designed to serve various purposes. When you’re searching for the right pit for you, be sure to know exactly how you will be using your fire pit, what color you want it to be, how much maintenance you are willing to perform, and how much you want to spend. Answering all these questions ahead of time will help you narrow down your search. We’re started by exploring the top-rated fire pits. These are the models that are guaranteed to be durable, diverse, and simple enough to suit your needs. After exploring these popular models, we created the Buyer’s Guide which includes even more options and will help you to expand your horizons even further. You can choose to customize your own unique fire pit if you have some extra money to spend. 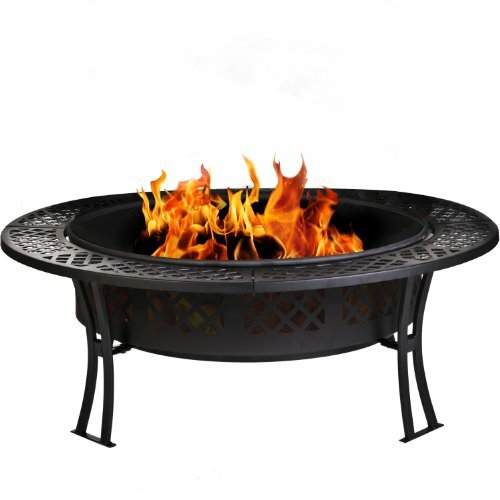 Or, if you’re on a budget, it’s a smart choice to get a lightweight and easily portable fire pit that can be taken with you on all of your various outdoor adventures. This Diamond Mesh Steel Fire Pit from CobraCo will effortlessly add a touch of warmth to your patio or garden. Featuring a classy design, the fire pit has a black, powder coating over its steel frame for a cozy, traditional look that will add to the overall ambiance of your outdoor setting. The high-temperature paint finish can withstand even the hottest fires, and the pit combines elegant aesthetics with an attractive diamond mesh style. Create a large fire with less effort and more safety, and always have an excellent view of the fire through the mesh exterior. The black-finished bowl sits securely in a sturdy, black, steel base that is supported by four metal legs that gently curve outwards. This base includes built-in risers that offer maximum airflow, ensuring the strongest flame possible. This fire pit is surrounded by a 5-inch wide table edge that can conveniently hold snacks, drinks and appetizers. This is made possible by the separation of fire bowl and frame so that there is no heat transfer. Another great feature of this fire pit is that it’s freestanding and can be taken anywhere. Weighing 44 pounds, the Diamond Mesh pit is completely portable, so you can move it wherever it needs to be in the garden, in your yard, or on your patio. It’s even possible to take the pit with you to a friend’s house, on camping trips, or to the park. Standing a mere 17-1/2 inches, the pit is also a perfect height for roasting marshmallows or hot dogs. With these many, great features, you can see why this is a top pick among consumers. It’s easy to clean by simply lifting out the bowl and tipping the ashes into the trash. With your purchase, you’ll receive a fire bowl, base, screen cover, vinyl cover, hardware, and a full booklet of instructions to show you how to use and maintain the pit properly. You’re guaranteed years of safe and rewarding use with this fire pit, and the vinyl cover will help you to protect the pit from the elements, and will also keep rain and leaves out of the bowl when not in use. Easy to assemble and maintain, you’re going to see that this fire pit will last you for years to come. This beautiful outdoor fire pit is made from slate and marble. With the included lava rocks, logs and square stand, this charming pit makes the perfect addition to any outdoor gathering. Charming and sophisticated in design, this pit also features a sturdy construction with wonderful details, and is a great product for the price that you pay. Perfect in size, and easy to use and maintain, this model from Blue Rhino is a top-rated fire pit because it provides you with all the features that you need at a price you can afford. The design accents are pleasing to the eye, and the slate and marble construction is designed to stand the test of time. Customers consistently praise this fire pit because it creates a stunning flame that is easy to see and enjoyable to be around. If you’re looking for a wonderful way to add a fire pit to your outdoor gatherings, but don’t want to go through the hassle of digging into the ground or creating a mess, then this pit is your best solution. 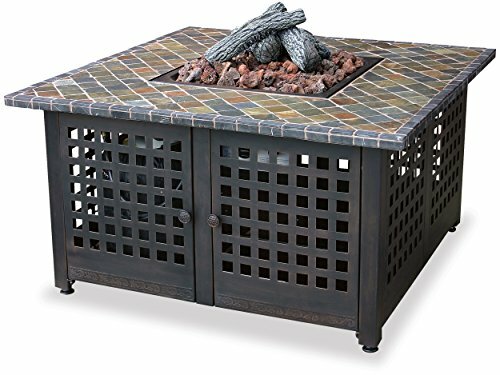 Featuring a 32-inch diameter size, and fine, bronze finish, this aged bronze outdoor fire pit from UniFlame comes with an easy-light spark arrestor and decorative lattice design that is simple to assemble. Compact in size, the fire pit can still provide you with a strong flame that adds ambiance and class to any outdoor gathering. The generous size and shape of this pit works perfectly with any sitting area, and the setup is straightforward. With its perfectly-sized width, you can fit wood into the center without having to cut every piece down. Also, the holes in the exterior allow you to see the flame at all times, and enjoy the view of burning embers. Holding a fair amount of wood, this fire pit allows you to burn fires for longer without having to replenish it. All in all, customers love this fire pit because of its fine construction and ease of use. The size is compact but still ample, allowing you to have a large fire but still move the bowl from place to place. Enjoy all the comfort and convenience of owning a fire pit for your yard, and you’re going to see how it enhances any event or social gathering. Roast marshmallows, cook hot dogs, or simply enjoy the image of burning embers. You’re going to be surprised how easy it is to clean and maintain this pit, and due to its fine construction, the fire bowl will last you for years to come with minimal signs of wear and tear. These are the top rated fire pits, and customers love them because they’re affordable, made of quality materials, and are easy to move from place to place. You can be guaranteed when you purchase one of these models that you’ll have a quality pit that provides you with a nice flame. These pits also offer additional options, such as being able to cook over the pit and use it as a table for entertaining. These models are also popular because they are crowd-pleasers in a social setting, providing a consistent source of warmth that invites conversation and relaxation. These fire pits are also easy to clean and maintain, and are backed by guarantees that protect you from manufacturer’s defects. It’s smart to purchase one of these top rated pits, but if you want to go a bit further, check out the below Buyer’s Guide. This was written to help you to find the perfect fire pit for your space, and helps you to narrow down your options. You may not be inclined to purchase one of the top rated fire pits because you’d rather have something that is more customized, and a permanent fixture in your yard. If this is the case, then the world is your oyster. You’re going to be amazed at all the sizes and materials that are available to you, so take a look at your yard and let your imagination wander. You can have a fire pit that really steals the show, or choose something that fits in more seamlessly with the landscape you already have. There’s nothing more charming than owning an outdoor fire pit. They provide you with a lovely source of warmth and act as a delightful centerpiece for social gatherings. Should you want to invest in a fire pit for your home, you may be feeling overwhelmed by all the choices that are out there. This Buyer’s Guide is intended to help you choose which fire pit is right for you, so you can narrow down the vast pool of selections. Finding the right fire pit for your home is about knowing your options, and knowing what your priorities are. Pretty much everyone enjoys relaxing outside their homes with a warm, glowing patio fire pit. This kind of outdoor fireplace comes in a variety of sizes and materials to choose from, and you can even build permanent fire pits on your patio. Owning a portable fire pit allows you to move the piece wherever you want it, depending upon the situation. Here are the three main benefits to owning a fire pit. Variety: There are a number of fire pits to choose from, and you’ll find that permanent fire pits are usually made of stone, clay, or fire-resistant brick. These tend to be quite elaborate and will easily be the focal point of your patio. Portable fire pits also come in a number of different materials and sizes, and it’s easy to carry them from place to place around your yard. It’s also possible to take these on camping trips, and they operate on either gas or wood. Range of Use: Fire pits will offer you a source of light, warmth, and they are even great for cooking. When you place grates or grills over the pit you can use it as a convenient BBQ area, and there are several advantages to cooking this way. You’ll find that BBQ food is more flavorful, and when the pit is large in size, you can cook for many people at one time. Safety: When you install your fire pit properly, and use it per the directions, this source of flame is incredibly safe. Most permanent fire pits will feature walls on all sides that help to prevent sparks from spreading outside the pit. It’s also possible to use wire mesh on top of the flame, for even extra security. It’s very easy to control gas fire pits with a simple knob mechanism. Size is one of the most important elements when it comes to selecting your fire pit. To begin, you must understand what it is you want from your fire pit. Do you want a permanent feature or something that is portable enough to take on trips? Fire pits tend to be large, permanent fixtures that are placed in outdoor spaces, but there are also smaller, more foldable accessories which are great for taking on camping trips. There is a whole spectrum of sizes that fit between these options. Large Fire Pits: Large pits are going to hold more wood, and therefore will provide you with a bigger fire. But do keep in mind that large pits are going to take more work to clean and maintain. If you intend to move the pit often, then buying a large pit is not going to be ideal for you, as moving it will prove to be a pain. If you’re buying a pit that is over 3 feet wide, you’re going to find that moving it will certainly be a hassle. Mid-Sized Fire Pits: A mid-sized pit is the most common that you will find because it offers a nice sized flame while still providing maneuverability and convenience. These will run anywhere from 30 to 36 inches wide and can hold a decent amount of wood. You’ll find that styles in this category have stands that make cleaning and disposing of ashes much easier and more convenient. Because this size is so common, you will find numerous styles to choose from. 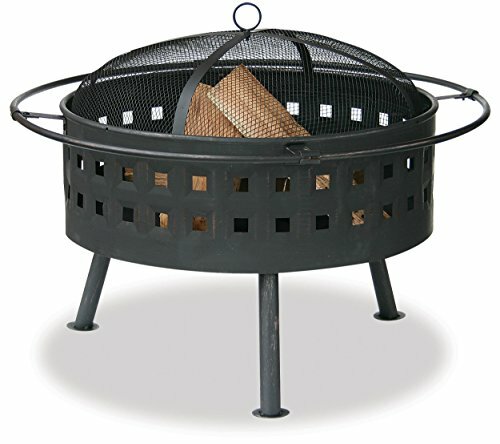 Small Fire Pit: A small fire pit is meant to be moved around quite often. For instance, you may purchase a small pit to be taken on camping trips or to a friend’s house for an outdoor BBQ. These smaller pits are often foldable, and come with carrying cases for easy transporting. There are also some models that have wheels for easy ash cleanup and transport. When it comes to finding your perfect fire pit, one of the most important elements is deciding what material you want it to be constructed out of. The materials are what will dictate the durability, and also the style. Ask yourself how you’d like the pit to fit into your overall decor, and this will help you to narrow down which materials might be right for you. Steel: There are many different models that are made of steel, and these will come at various different prices and levels of quality. What’s so great about steel is that it can be molded into any shape imaginable, so there is infinite variety of construction. However, when steel is left unprotected, it can rust over time. That’s why it’s important to purchase a pit that is powder coated and also stay aware of the physical changes that are occurring in the steel over time. Some high-end models are handmade by a steel artisan, and these pieces are incredibly unique. There are also less expensive versions that are quite common and will come in various sizes and shapes. Brick: Tile, stone and brick pits are wonderfully unique and artistic. These usually have a solid steel frame and mesh body, and then the stone is applied to the mesh body by way of standard masonry procedures. Keep in mind that rock fire pits are very heavy and it will be difficult to move them. This is the kind of pit you buy when you want to keep it in the same place at all times. Copper: This is the crème de la crème when it comes to fire pits. These pits will never rust, and in fact, fire pits that are made from copper will develop a wonderful patina over the years, only enhancing their attractiveness. Copper can be molded into pretty much any shape, and will last you forever. Keep in mind that copper fire pits are going to be the most expensive that you will find, but it’s definitely worth the price in the long run. Cast Iron: This is one of the most common materials used in the construction of a fire pit, because it’s inexpensive, easy to work with, and lightweight, allowing you to move the pit wherever you need it. This material is not as strong as wrought iron, nor as heavy, but the lightweight nature makes it easy to move these pits around from place to place. Stainless Steel: Stainless steel offers a number of great features. Take for instance the fact that it is rust free, durable, and stays good looking for years to come when maintained properly. Stainless steel has a fine, industrial look that many people love, while still being incredibly functional. Unfortunately, stainless steel fire pits are quite rare, and only come in a few styles. This is due to the fact that stainless steel is quite costly these days. Another very important consideration is how you plan to use your fire pit. Are you just planning on enjoying an outdoor fire or do you also want to use the pit to cook food and act as a fine piece of decor? There are so many different kinds of pits out there that you can find something to fit your specific needs, when you know what those needs are. Grilling Fire Pits: If you know that you are definitely going to be doing some cooking with your fire pit, then a grilling pit is a great solution. Grilling is a very American thing to do, almost as American as apple pie, and having a fire pit that can also function as a grill is a smart and delicious choice. There’s no doubt that food that is prepared over an open flame is much more tasty, and that’s why many pits come with a cooking grate. It’s also possible to buy a grate separately and use it with a pit that you already own. Fire Pit Table: These tables function in multiple ways. They will provide heat while you’re relaxing in an outdoor area, and they’ll also give you a surface where you can conveniently place drinks during outdoor gatherings. Sitting at a fire table is a wonderful way to enjoy the glow of the flames, and they range in size from conversation or coffee tables to full-on dining and bar tables. There are many beautiful designs out there with mosaic tiles, wrought iron elements, decorative glass, and so much more. It’s easy to incorporate fire pit tables into your outdoor furniture decor, with so many styles to choose from. Fire Pit Art: There are a number of artistic pits to choose from, with metal artisans who design wonderful works of art that add to the overall decor of your yard. These are hand-crafted and one of a kind, usually made from steel and designed to portray various scenes or abstract concepts. Custom Fire Pits: You can have a customized pit made, and this makes a stunning addition to your yard. You can do all kinds of things, such as having your family name etched into a fire pit, or various designs that you love most. These fire pits are often made from copper so that they will not rust and are fully customizable to suit your desires. This also makes a stunning personalized gift or wedding present. There are three main fuel sources to choose from when you’re purchasing a fire pit: propane, wood, and natural gas. Each of these has its own advantages and disadvantages to consider. A wood burning pit is usually less expensive than the other options, and will create a larger, hotter outdoor fire than the other two fuel options. The downside to owning a wood-burning pit is that starting the fire will be more difficult and will require more effort. You will also have to factor-in the purchasing of wood, storing the wood, and disposing of the ash when the fire is done. The great thing about a propane fire pit is that it comes with a push-button ignition, making it easy to start a fire in seconds. There is absolutely no messy cleanup involved with these kinds of pits, and that means no embers or ash to dispose of. It’s very easy to control the height and intensity of the flame, and that means that the level of heat is always up to you. The downside to owning this kind of pit is that liquid propane costs more, and you’ll need to replace the LP tank once it has run out. The tank can also be a bit of an eyesore, but you can find models that have a base that hides the tank from sight. Natural gas fire pits are definitely the most expensive, but they are also the most practical and economical in the long run. These function via a gas line that runs to your fire pit by a licensed professional, and that means that there is no huge tank that disrupts the style of your outdoor space. There is also a simple and easy to use ignition and control mechanism that makes operating this kind of pit easy as pie. Keep in mind that the initial investment and installation of this kind of pit is quite expensive. In the long run though, it’s cleaner and more inexpensive than a propane pit. Owning a fire pit is a wonderful way to add to the overall decor and hospitality of your patio or lawn. Whether you want to simply lounge about and stare at the flames, or if you want to use the pit for cooking and entertaining, you’re going to see that there are so many models out there to choose from, in a variety of different materials and styles. You can choose to use an open flame, or you can go with propane and gas for even easier fire options. No matter what kind you choose, you’re going to find that you will love the convenience and fun of owning a fire pit of your own. The above Buyer’s Guide is intended to help you better understand home fire pits, and what they have to offer. There are so many options out there that you may feel slightly intimidated at first, but take heart. Finding the right fire pit for you is easier than you think, and you’re going to see that once you figure out your priorities, it’s going to be easier to decide than you think. It comes down to knowing what you’re going to use the pit for, where you want to place it, and whether or not you want to move it. If you have a lot of cash to spend, then definitely consider getting a customized pit made out of copper materials, but if you want something that is more convenient, get a small model that can easily be taken along on camping trips. Once you have your pit installed, it’s time to enjoy the beauty of a natural open flame, and go ahead and roast a marshmallow while you’re at it.